A total of 2000 farmers have been trained in organic farming. 200 ha of land have been converted to organic farming. 410 kitchen gardens from 20 villages produce fresh vegetables, spices and food for 9 months annually. Valli has proved that a small patch of land is sufficient to feed a family of 5, and to preserve and store produce to secure household food security throughout the year. Farmers and landless garden holders in the 21 villages where Anisha is active, are completely self-sufficient with respect to food and seeds. Their health and physical strength has improved – and what is most important - they have learnt to live with the preparatory, the planting and the harvest season and their produce is in demand by shops and individuals. A revolving fund is being circulated among the self help groups. It allows goat rearing and other small time trading as the processing of organic produce for markets and traditional feasts. 306 varieties of local seeds (mainly millet) are stored in the seed bank at the Resource Centre. Home gardening has been promoted to 23 local schools, targetting 1500 children from 7th grade upwards since 2016 The land around the Resource Centre is being reforested to attract more rainfall. A farmers federation has been founded to facilitate the marketing of produce and Anisha has its own label for easier recognition. Anisha has received and accommodated various guests from other institutions, individuals and groups in its airy and spacious facilities. Some government schemes were channelled to farmers, like sprinklers, farm ponds, tarpaulin and sprayers. Anisha has a good rapport with the Agricultural Department, they are inviting Valli as resource person and also bring farmers to ANISHA for exposure. MYSURU: A seed of an idea has hugely transformed the lives of villagers in some parts of Kollegal taluk and aided rural development, all thanks to the initiative of Valliammal (46) and her husband Rajan Palaniyappan (46).Through their Anisha Foundation, set up at Martalli, the couple has been conserving native varieties of seeds and promoting sustainable organic farming and kitchen gardening among small and marginal farmers and landless families in Martalli, Male Mahadeshwara Hills and Poonachi panchayats. The couple’s journey began in 2006, visiting remote villages, tribal communities, meeting older farmers, both in Karnataka and Tamil Nadu, and collecting native seeds. What started with a small collection of seeds has today grown into a bank with over 300 varieties. Valliammal and Rajan have 53 varieties of finger millets, seven varieties of minor millets, 96 varieties of dry-and-wet land paddy, 36 types of brinjal, six varieties of okra, five varieties each of beans and pumpkin, 12 types of bottle gourd apart from oil seeds, pluses, multicolour maize, tomatoes, some varieties which were on the verge of extinction, and also green manure. Seeds from the bank are distributed to farmers, who return double the quantity after harvest. The idea has caught on so much that some farmers have also started their own small collections of seeds at home and lend these out to neighbours.The main activities of the Foundation include training marginalised farmers in organic farming, improving soil quality, creating women’s self-help groups and developing income generating activities for farming and landless women, helping establish organic kitchen gardens, and setting up seed banks, to increase self-sufficiency of the local population. The couple assists the villagers every day on the matters. Orientation, training and demonstration on kitchen garden for school students are also provided. “We noticed that the living condition of people in Martalli was quite bad and families were migrating. We thought of improving the economic, environmental, health and nutritional condition in villages of Martalli panchayat, which has a population of about 15,000 people. The initiative has helped prevent migration of villagers. Farmers from Chennai, Andhra Pradesh, Tamil Nadu, and other states are also contacting us seeking seeds. The sad part is that we are not able to provide seeds to people with larger land holdings,” says Valli, a lawyer, community activist and organic-farming expert. “Our intent is to bring back native seeds to the farming community. Many of the hybrid seeds available can only be used for one season and do not produce a good yield if used for a second crop. Also, farmers have to shell out more money for hybrid seeds. Native seeds can be harvested every year and can regenerate for decades,” she adds. “The Anisha Foundation initiative has helped us a lot. Earlier, we were thinking to quit farming, but now we wish our children also continue farming. The scenario of our village has changed drastically in the last six years. Now villagers growing vegetables in their backyards and promotion of kitchen gardening in schools from 2016, has helped us lot,” says Madaiah, a villager. “The villagers have good health, food security and lower debt, compared to earlier. 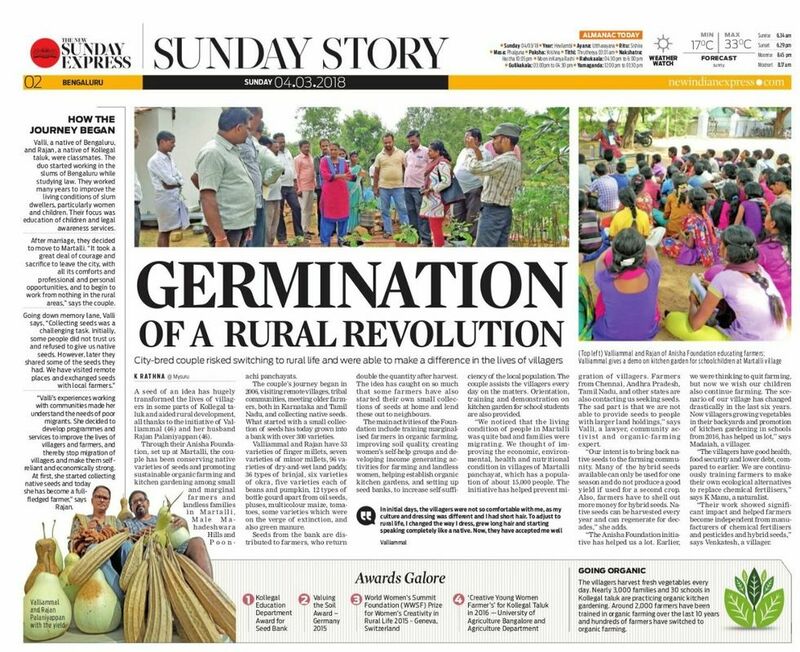 We are continuously training farmers to make their own ecological alternatives to replace chemical fertilisers,” says K Manu, a naturalist.“Their work showed significant impact and helped farmers become independent from manufacturers of chemical fertilisers and pesticides and hybrid seeds,” says Venkatesh, a villager. Valli, a native of Bengaluru, and Rajan, a native of Kollegal taluk, were classmates. The duo started working in the slums of Bengaluru while studying law. They worked many years to improve the living conditions of slum dwellers, particularly women and children. Their focus was education of children and legal awareness services. After marriage, they decided to move to Martalli. “It took a great deal of courage and sacrifice to leave the city, with all its comforts and professional and personal opportunities, and to begin to work from nothing in the rural areas,” says the couple. Going down memory lane, Valli says, “Collecting seeds was a challenging task. Initially, some people did not trust us and refused to give us native seeds. However, later they shared some of the seeds they had. We have visited remote places and exchanged seeds with local farmers.” “Valli’s experiences working with communities made her understand the needs of poor migrants. She decided to develop programmes and services to improve the lives of villagers and farmers, and thereby stop migration of villagers and make them self-reliant and economically strong. At first, she started collecting native seeds and today she has become a full-fledged farmer,” says Rajan.